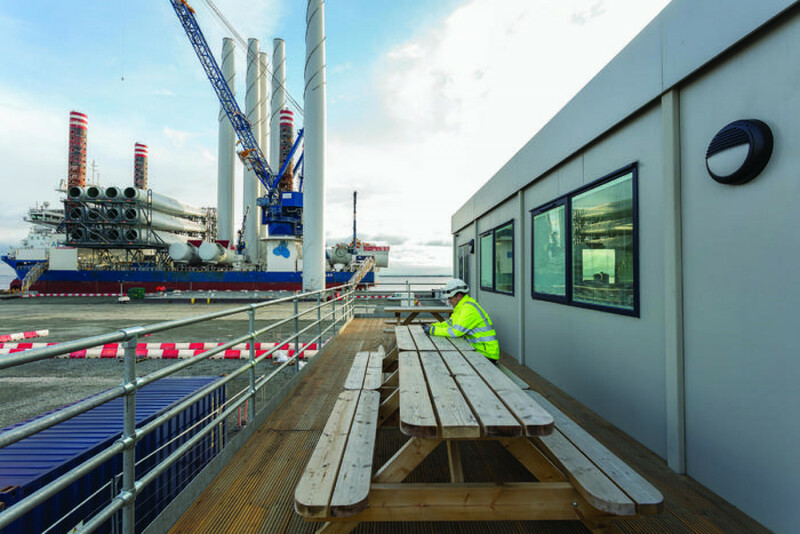 With space at a premium on the site at Green Port Hull, Siemens Gamesa Renewable Energy were looking for multifunctional space that would be as welcoming to its busy on-site employees as it would be for visiting customers. As pioneers of a new generation of wind turbines, Siemens Gamesa Renewable Energy has invested £160 million in a specialist facility in East Yorkshire where its wind turbine production plant will sit alongside its assembly and servicing facility at Green Port Hull. With the UK leading the way in offshore wind energy and with some of the best resources in Europe at its disposal, the site at Green Port Hull is well placed to support the efłciency targets set for the industry by 2020. The state-of-the-art facility is located on reclaimed Humber Estuary land, placing it at the mouth of the River Humber, enabling turbines to be produced, assembled and sent to sea from one location, an innovative way to drive down the overall cost for producing these giant structures. Portakabin responded to the demanding brief which included a difłcult location, challenging environment and tight timeframe. Siemens Gamesa Renewable Energy approached them in need of łve ofłce and welfare zones for clients and employees which would in turn support the construction project ofłce for wind turbine pre-assembly. The finished building features a custom-built viewing platform and two-storeys of ofłce space, shower and welfare facilities, kitchens, break out spaces and common rooms. Client meeting rooms were speciłcally łtted out with custom vision panels to provide look out points for visitors over the live production site without having to take them onto an active manufacturing site. Portakabin supplied, installed and maintained almost 1000m2 of Ńoor space after less than siT weeks on site. The building system itself offers exceptional levels of insulation and air-tightness, providing a comfortable, warm and welcoming ofłce environment that’s also energy efłcient.